If you are visiting any special event or occasion then it is important to look the charming and attractive. Apart from choosing the right kind of dress of the occasion, your looks are enhanced with the special hair style. As most women and girls like curly and cute look, they use hair curlers to give the curly look to their hairs. To choose the right type of hair curlers, take a tour of the hair curlers products gallery on DealsCorner, and find products from all major brands and online stores on a single platform. 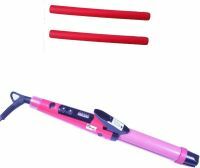 You can find wide a range of hair curlers models in which some of the models use heat to curl the hair, while some do not. Before choosing the type of hair curler it is necessary to check all options and then decide. Some of the models are specially designed for large set of curls while some are made for tight spiral curls. Some of the popular types of hair curlers are heated curls, plastic mesh curls, foam rollers, Velcro hair curlers, magnetic curlers, and hair twisters. The heated hair curlers are available in a set with different diameters which uses electric power to heat. You can find hot and steam hair curlers in the heated curl models. The hot curlers can be used immediately once it is heated while the steam hair curls can be used once the hair is dry. Most women use the heated hair curlers because it gives long lasting effect. One should ensure that the end of the hair section should be tucked before using the curler. You can also find plastic mesh curlers which are used for wet hairs. As it is made up of mesh, the hair dries faster and gives a smooth and curly effect to the hair. For gentle hairs, you can use the foam curlers which are made for dry hairs. You can sleep on using the foam curlers as they are soft and gentle. If you have long and thick hairs then you should look for the Velcro hair curlers. You can use the Velcro hair curlers on wet or dry hairs, with or without clips, as per your requirements. Some women also use the magnetic curlers which are made for wet hairs. After taking a shower, you can put them on your hair and let it dry for sometimes. When you start with the wet hair, the curls will last long with the magnetic hair curlers. There are hair twisting curlers which come with long rods and cushioning to provide tight and spiral curls without using pins or clips. Some of the additional accessories that you would like to add to your list along with the hair curlers are roller clips, pins, hair sprays or hair combs. These accessories help in providing enhanced finishing. You can find all sorts of hair curler products and accessories on DealsCorner from all major stores and brands. We have many well-known brands like Babyliss, Remington, Torlen, Nova, Corioliss, Andis, Vega, Philips, Casa and many more. To enhance your shopping experience, DealsCorner brings all major online stores and brands under the same roof. You can search the product of your choice, compare the prices offered on various online portals and finally choose the product of your interest in the lowest price available in India. Enjoy your shopping on DealsCorner and share your experience with us, by posting your reviews.